Hey girl hey! Summer is finally here (can you believe it?!) and it feels like the invites are pouring in for everything from rooftop happy hours and weddings to graduations and summer garden parties. To kick off this season with style, I’m partnering with David’s Bridal, one of the world’s most popular bridal brands, to help you pick the perfect dress for any occasion. Ready for the most stylish summer ever? 5, 4, 3, 2 , 1…and go! 1. Look at the event’s dress code. Is the celebration black tie? Cocktail attire only? Casual? This is one of the most important aspects to keep in mind before you go dress shopping. For example, wearing a ball gown to a high school reunion at a brewery may not make the best impression (unless you are just that extra - in which case I say, go on with your bad self). Wearing an off-the-shoulder shift dress that shows off that killer tan you got while in the Caribbean and all that time you spent at SoulCycle? Yes, please. 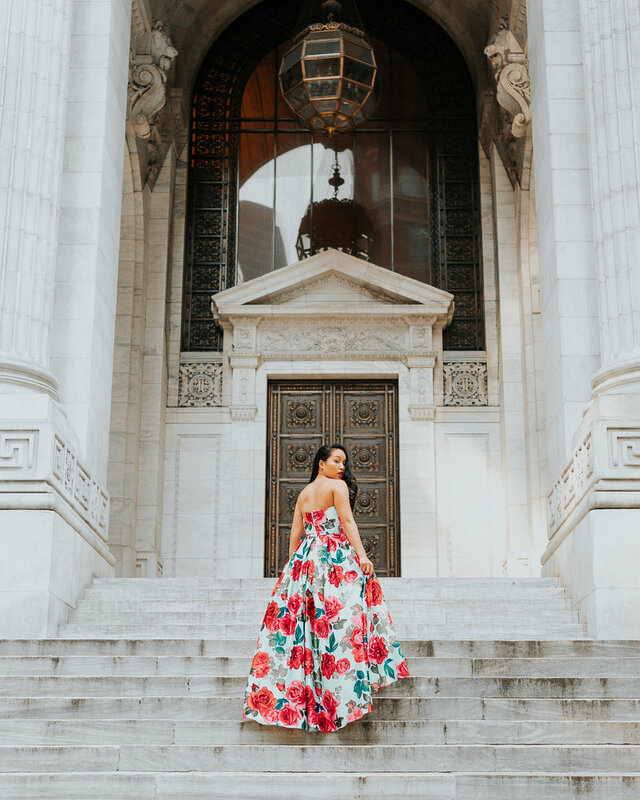 While David’s Bridal definitely has a great selection when it comes to weddings and bridesmaids gowns, they also have a killer mix of both super stylish long and short dresses and more casual pieces too. Since they offer dresses in sizes 0 - 22, it’s a must-stop spot if you’re going shopping with your girlfriends - there’s something for everyone! 2. Decide on your budget beforehand and stick to it. I’ve been watching shows like “Say Yes to the Dress” for what seems like forever, and one of the saddest moments on the show is when a bride decides to try on a dress that’s way outside of her budget. She inevitably falls in love with it and then has to say no and settle for something else that she doesn’t love. Let’s be real - life is short and ain’t nobody got time to settle. With amazing companies like David’s Bridal, you don’t have to worry about emptying your bank account when you’re getting your shop on. I fell in love with this Betsy and Adam bold floral satin ball gown as soon as I saw it (ginormous roses + bright colors = please get in my closet ASAP), and didn’t have to worry about the price tag (hard to do when you’ve got champagne tastes on a beer budget, amirite?) This dress got so many compliments at the gala that I wore it to and made me feel like a modern-day Cinderella. The best part? Knowing that this ball gown didn’t cost me an arm and a leg and later turn into a pumpkin at the end of the night. 3. Look for stylish pieces that make you feel like the best version of yourself. Summer is all about having fun and not playing by the rules, so your wardrobe should definitely reflect that. Say “girl, bye” to those stuffy black dresses that you always hate wearing and instead reach for something that’s got just as much personality as you do whether it comes to the perfect dress, shoes, or accessories. Keep an open mind and don’t be afraid to pull something off the rack if it catches your eye. One of the best parts of shopping is getting to play dress up and try things you normally wouldn’t. What are your tips for finding the perfect dress for the summer? Any special occasions that you’re celebrating? Will you be playing dress up at David’s Bridal soon? Tell me in the comments or on social media at @melaniesutra!